Electric heaters work through resistance. That is, electrical line voltage flows through a heating element, and as electrical resistance is encountered at the heating element, the element heats up. Electric wall heaters will require a dedicated electrical circuit of 120 volts or 240 volts, depending on the unit size and the size of the room to be heated. (Click here for a tutorial on installing a 240-volt circuit). Electric heaters work by convection or radiant heat. Convection heat uses the natural law that hot air rises and relies upon natural convection to move the heat around the room. 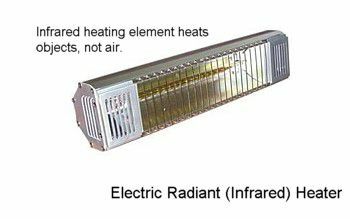 Radiant heat or infrared is different in that it heats objects, not the air. Why is this important? Well, it can determine where certain types of heaters may be located. 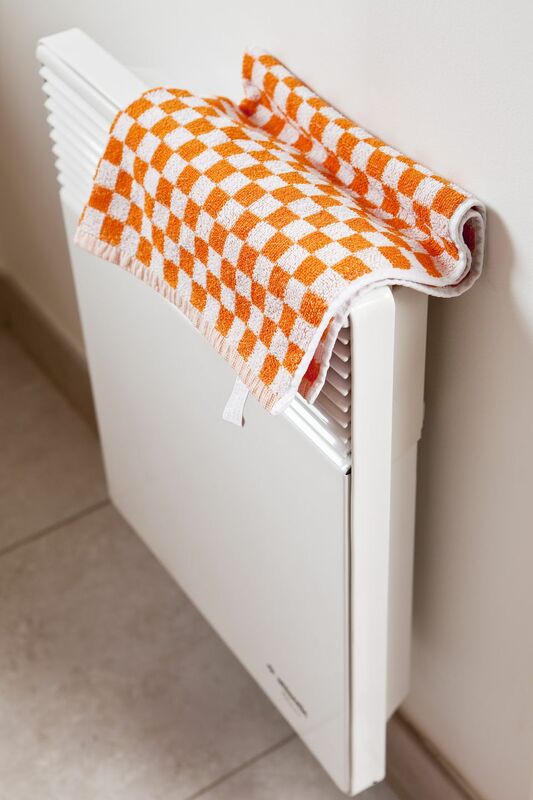 A convection heater will need to be located near the floor level as it has to heat cold air at the floor. A radiant heater can be located at the floor or ceiling level since it is heating objects like room occupants or the floor or tub and so on. Let's take a quick review of each style before purchasing an electric heater. Wall heaters are useful for supplemental heat in small rooms, especially a bathroom. They are usually recessed in the wall cavity between two wall studs and are most often a convection style heater with a motorized fan although some models use silent radiant heat with electric coils and reflective back panel. Most of these units are self-contained and have built-in thermostats. These units should not be installed in exterior walls because of the conflict with exterior insulation and the condensation problems you will have with hot metal in a cold exterior wall. Electric baseboard heaters look like hydronic (hot water) baseboard heaters but use electric heating coils for nonmotorized convection heating. Baseboard heaters neither have room for nor are they proportioned for effective motorized cooling, so they let old mother nature take care of moving the hot air. By using convection, cool air is drawn into the bottom slots and warmed by the heating coils and fins. Then warm air exits from the top slots of the unit. These units are usually placed beneath windows to counter heat loss through the glass. A remote line voltage thermostat may be used to control the baseboard heater, or it may come with integrated thermostat control. It is important to keep the unit clear of drapes and unobstructed by furniture for best performance. Toe-kick heaters are ideal for limited space applications. They are designed to be very low profile, about 3.5" which allow them to fit nicely in a 4" toe space under cabinets and vanities. Their proportions allow the use of a motorized forced air fan to distribute warm air. For best performance, they should be used as a supplemental source of heat and have a remote line voltage thermostat. However, most models also have the option of a built-in thermostat. Electric cove heaters use direct radiant (infrared) heat for maximum comfort. Since radiant heat does not warm the air but rather objects, you, your tile work, tub, etc. are all warmed by the radiant heat energy of the panel. Radiant heat allows the panel to be placed anywhere, so this is the reason the cove heater can be located on the wall just below the ceiling. Out of the way but still effectively located for your comfort. Like other electric heaters, the cove heater works with a remote line voltage thermostat. Will Running an Electric Dryer Drain Your Wallet Dry? How Does a Furnace or Boiler Thermostat Work?